As a former ice age refuge, the highland rainforests of South West Cameroon are among the oldest forests and comprise the richest flora and fauna in continental tropical Africa. 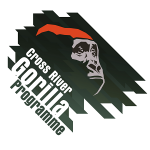 The area is one of the world’s most important biodiversity hotspots, encompassing high levels of endemism and endangered species such as the Cross River gorilla, Nigeria-Cameroon chimpanzees, as well as forest elephants. Most of this unique forest is community land with no formal protected status. The forest, for the most part, is a community land with no formal protected status. The main drivers of deforestation and forest degradation in this part of Cameroon are forest conversion for agriculture – large scale (industrial) as well as subsistence (slash and burn) farming, wood harvesting, infrastructure development and illegal logging. The African Conservation Foundation, Environmental and Rural Development Foundation and community-based organisations (CBOs) are working together in this region to halt rainforest loss, while developing new livelihood opportunities with local people. Since 2004, we are running a rainforest conservation programme based on resource-intensive ground surveys, building up trust and collaboration with local communities, and our combined experience. Much of the information on what is happening in the forest is hidden and deforestation often comes to light when it is already too late. The success and efficiency of our conservation activities, such as forest monitoring, law enforcement and the establishment of protected areas could be greatly improved by taking informed decisions based on up-to-date information, as close to real time as possible. This is where Global Forest Watch (GFW), a World Resources Institute-convened partnership that uses satellite images to track tree cover loss in near-real time, comes in. GFW empowers people to better manage and conserve forest landscapes through an interactive online forest monitoring system. The GLAD (Global Land Analysis and Discovery) Alert system available through Global Forest Watch detects tree cover loss on an annual and weekly basis. GLAD Alerts were developed by the University of Maryland’s Global Land Analysis and Discovery (GLAD) Lab and are available for display and download on the Global Forest Watch web platform. GLAD Tree Cover Loss Alerts provide an unprecedented opportunity for understanding and monitoring the threats to forest ecosystems, and also provides tools to maximise the efficiency, effectiveness and equity of on-the-ground monitoring, law enforcement and forest policy interventions. We have been pilot testing the Forest Watcher, an app for Android phones developed in collaboration between the Jane Goodall Institute, Google and World Resources Institute as a way to bring Global Forest Watch tree cover loss alert data offline and into the field. We downloaded GLAD data, customized the types of information to be collected, and trained community members so that they could validate tree cover loss data in the field. Once set up, Forest Watcher is a user friendly and low-cost tool for deforestation and forest degradation monitoring. One of our challenges on the ground is how to make Global Forest Watch data available and accessible to communities who are computer-illiterate, living in remote areas without electricity or internet. Our project zoomed in further and makes Global Forest Watch data available and accessible to local communities by using an innovative tool, Participatory 3-Dimensional Modeling (P3DM), for transforming spatial information into a format that communities can manage and develop themselves. Community-based forest monitoring using Glad Alerts, Forest Watcher and P3DM as integrated tools has great potential to complement remote sensing based alert systems and engaging local people into active forest guardianship, while delivering a number of livelihood and conservation benefits. P3DM is an interactive, visual tool that facilitates the gathering of information and placing it into a physical 3-dimensional model of focal areas. That same model can be used to display and disseminate Global Forest Watch data concerning tree cover loss, concessions and other relevant information. By definition and through its guiding principles, P3DM is a participatory and equal opportunities approach. One of the key requirements is the engagement of all community members, of both genders and of all ages, because they represent different forest user groups. The physical 3D model of the landscape serves as a powerful tangible monitoring tool that is always available for community members. Together, GFW data and the P3DM model, literally, provides a round-table to gather stakeholders and discuss the latest threats and developments in the highland rainforest. It is a tool to engage local traditional leaders and communities, the municipal government and the local Ministry of Forestry and Wildlife in the long-term management of the forest. Making this data accessible and available through an interactive online map and develop use cases for the various decision makers including MINFOF and other authorities. As a direct result of the project, local communalities in the project area are increasingly involved in the forest monitoring process in the community and surrounding forest using GFW. The applications used in this project help realising much needed pro-active enforcement and engagement in rainforests in and outside Cameroon’s protected areas. Community Forests established through this programme provides a mechanism for empowering local stakeholders to take on a greater and more responsible role in protecting their natural heritage. 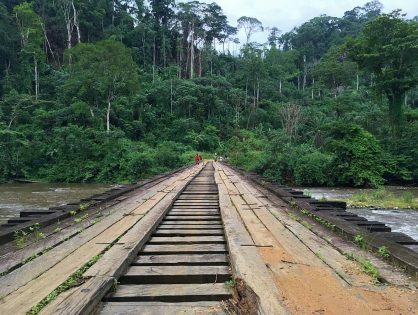 According to Chief Tarh Frankline of Egbemo, his community wanted to establish a community forest but did not know how to go about it. The last ‘vente de coupe’ that was hosted by his community did not do much in terms of development. Vente de coupes are large volumes of standing forest advertised by the government for sale to private individuals or timber companies for exploitation. These companies pay taxes to the government from which a percentage is given to the village councils concerned for the development of their areas. The project also demonstrates that communities are eager to embrace new technologies and participate in this programme because it provides them with the tools and skills that strengthens their position in interactions and negotiations with other (local, divisional and international) stakeholders and interested parties. In addition, the P3DM component of the project brings out the knowledge of communities. Local people expressed that they are losing the knowledge of the elders. The place-bound, historical knowledge of the elders about natural resources and cultural or sacred sites, including their original names, has never been documented in these communities and this is an aspect of the project they are very excited about and grateful for. With the help of the tools and technologies used in this project, 200 members of forest adjacent communities, 3 government officials and 7 project staff now have the skills and capacity to generate through a participatory process, spatially defined geo-referenced data. This enables local community members to monitor deforestation and forest degradation activities on the ground, using the Forest Watcher application. At the same time, local institutions and communities help improve the accuracy of GFW international monitoring instruments, by ground-truthing remote sensing data. 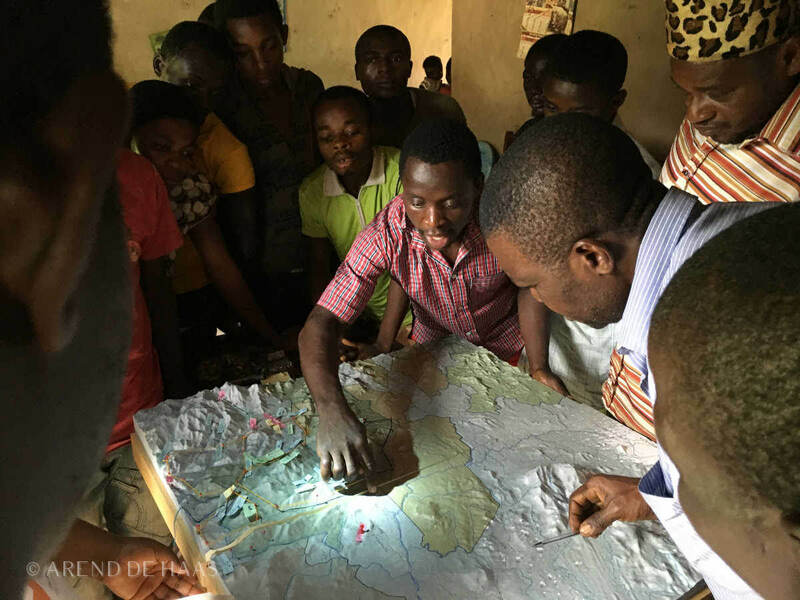 By adding data onto the 3D Model of the project area, project staff, government officials and community members gain a better understanding of why and how the forest is disappearing so that they can take concrete management decisions. 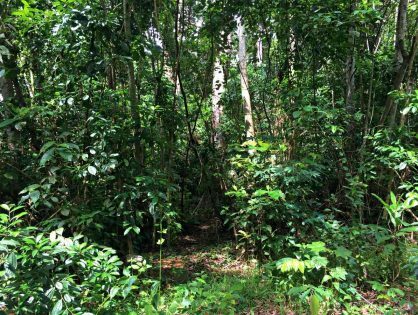 This will enable more effective forest management while immediate threats to critically endangered wildlife species will be addressed through an early warning system indicating areas that have experienced recent forest loss through illegal activities.